In a book-interview, Cardinal Yves Congar, one of the most influential theologians at Vatican Council II, offers an unusual piece of data in his eulogy of Fr. Marie Dominique Chenu, his mentor and colleague. Indeed, instead of converting Muslims, Fr. Chenu used to teach the religion of Mahomet to Muslins during the war of liberation of Algeria from France. 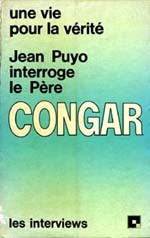 At right, the cover of Jean Puyo interroge le Pere Congar. Below, we present our translation of the highlighted text. Fr. Chenu has a continuously outpouring intelligence. He has that type of intelligence which you just mentioned: one that does not close itself to any perspective, but to the contrary, opens itself to everything. He is open to every kind of knowledge. 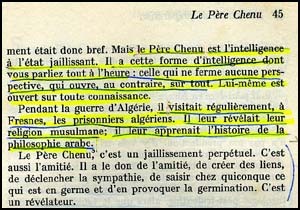 During the war of Algeria, he regularily visited the Algerian prisoners at Fresnes. He revealed to them their Muslim religion; he taught them the history of Arabian philosophy.